It seems that you can never truly understand a situation until you can understand both sides of the argument. This is what Senator Dianne Feinstein (D – CA) is discovering this week. Senator Feinstein, the chair of the Senate Intelligence Committee, accused the Central Intelligence Agency (CIA) of illegally searching Senate computers. The computers were used by staffers for the Senate Intelligence Committee to prepare a report detailing the CIA’s use of harsh interrogation techniques in the wake of the September 11th attacks. Prior to the CIA’s alleged intrusion into the Senate computers, however, Senator Feinstein was an avid supporter of the national security policy of the United States; especially since Edward Snowden released information about secret U.S. surveillance programs. The Senate and the CIA have been arguing over the intrusion long before it made national news. In 2012 the Senate staff completed the aforementioned report on CIA interrogation techniques. It remains classified, but the press has reported that the first draft concluded that the Bush Administration had overstated the usefulness of hash interrogation techniques for gaining information. The first draft also found that the CIA had over emphasized the need for hash interrogation techniques to Congress. The CIA read the first draft and objected to most of it. The CIA alleged “factual errors” and “errors in judgment.” The CIA and the Senate have been arguing for months over what information should be included in the report. The CIA, after conducting electronic searches on Senate computers, found what it believed to be evidence of criminality. The evidence implicated Senate investigators, and the CIA referred it to the Justice Department. This is when Senator Feinstein replied to the CIA’s accusation on the Senate floor. Senator Feinstein accused the CIA of violating the Fourth Amendment, as well as Executive Order 12333, which does not allow the CIA from conducting domestic searches. Other Senators have joined Senator Feinstein’s fight. Senator Mark Udall (D-CO) wrote a letter to President Obama urging the release of the report. Senator Udall cited the ongoing conflict between the CIA and the Senate as a reason why the report’s declassification should be a priority. Senator Harry Reid (D-NV) also described the CIA’s allegations that the Senate staffers hacked into classified CIA networks as “absurd.” Senator Reid wrote a strongly worded letter to CIA Director John Brennan, explaining that the CIA has produced no evidence to support its claim that Senate staffers hacked into the CIA system. The Senate and the CIA have drawn their respective lines in the sand. One person who has not taken a side, however, is President Obama. After Senator Feinstein’s speech on the Senate floor, President Obama explained that he wanted to remain neutral in the feud. President Obama is stuck between a rock and a hard place. On one side, he finds a loyal Senator in Feinstein, and on the other side he finds his trusted CIA ally and former advisor in John Brennan. While the President himself may not be making any statements about the situation, top Obama Administration officials were sent to California to meet with Senator Feinstein. The lack of transparency in our intelligence community has been pushed to the forefront once again. President Obama has said that he wants the CIA to release the confidential report about enhanced interrogation techniques, but many are quick to remember that President Obama also promised the closure of Guantanamo Bay. The facility remains open. Then-Senator Obama was also very critical about the domestic surveillance programs run by the National Security Agency (NSA). This criticism went away, however, after Senator Obama became President Obama. Only after Edward Snowden released documents revealing the NSA’s vast surveillance program did President Obama take action. Even then, the changes that resulted in the program were modest at best. 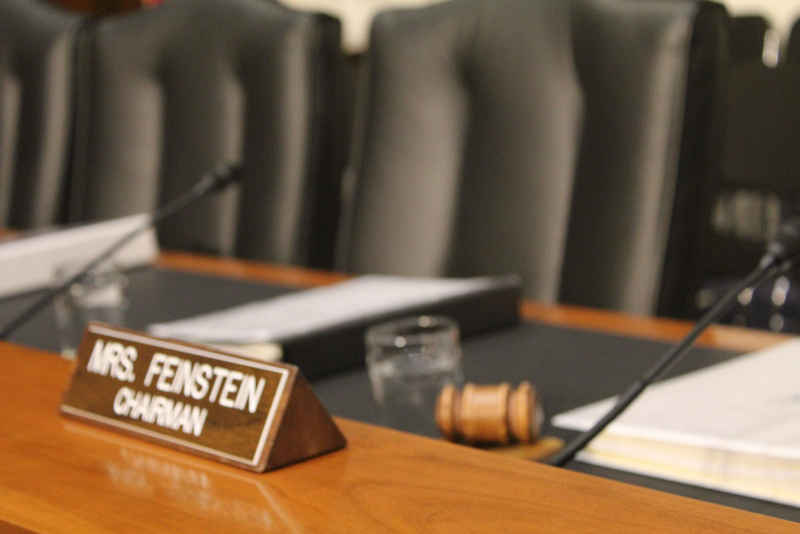 One of President Obama’s staunchest allies in the days after the Snowden leaks was Senator Feinstein. That is what really makes this situation so interesting. President Obama is stuck with nowhere to turn. If he choses one side over the other, he risks alienating a trusted Senate ally or a trusted CIA director. What this situation really brings to light, however, is how secretive the surveillance system in America still is. The lack of transparency is breathtaking. The American people were outraged, and rightly so, after Edward Snowden revealed the surveillance apparatus run by the NSA and CIA, but was anything done to correct it? It would seem that not too much has. Senator Feinstein, one of those whom supported the program, now sees what the American people were so upset about. It’s a shame that one must be wronged in order to see what is wrong. DC Council Votes to “Just Say Yes”?